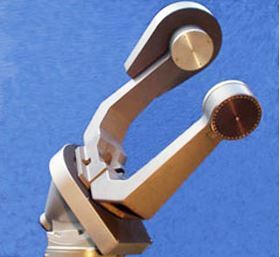 We offer 3 basic models of fork mounts: MI-500, MI-750, and Mi-1000. We also offer hybrid models that feature a larger fork on a smaller polar base. These model are intended for those needing larger swing-through and greater arm separation for tube assemblies of modest weight. The hybrid model are the MI-500 polar base with MI-750 fork, the M-750 polar base with a MI-1000 fork, and the MI-1000 polar base with a MI-1250 fork.